(Photo: Reuters / Jonathan Ernst)Rev. 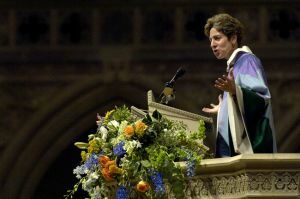 Katharine Jefferts Schori delivers the homily at her investiture as the Presiding Bishop of the Episcopal Church at the National Cathedral in Washington, November 4, 2006. The Episcopal Church has obtained concessions from nine bishops who opposed the denomination in court disputes over church property and funds. Nine bishops of the U.S.-based Episcopal Church signed an agreement last week that they will no longer help breakaway factions involved in court disputes involving property and funds with the national denomination. The bishops, who are called 'Respondents' in the agreement, said they "express regret for any harm to the Bishops, clergy and laity" of the dioceses involved. The decision is part of a broader agreement reached last week between the nine bishops and members of the dioceses of Quincy, Illinois, and Fort Worth, Texas who are involved in court disputes. It was also approved by denomination's top bishop, the Most Rev. Katharine Jefferts Schori. The agreement notes the nine bishops, who all work outside of the dioceses in question, filed friend-of-the court briefs with courts in Texas and Illinois in 2012 and 2012 respectively. The agreement notes the agreement is meant to "promote healing, repentance, forgiveness, restitution, justice, amendment of life and reconciliation." Exactly what was discussed at a meeting between the parties on January 8 and 9 in Richmond, VA, remains confidential, however. Part of the agreement indicates the bishops will not make any more filings against the Episcopal Church's position until the church as a whole addresses the matter at its General Convention by altering the church's Constitution and or canons.